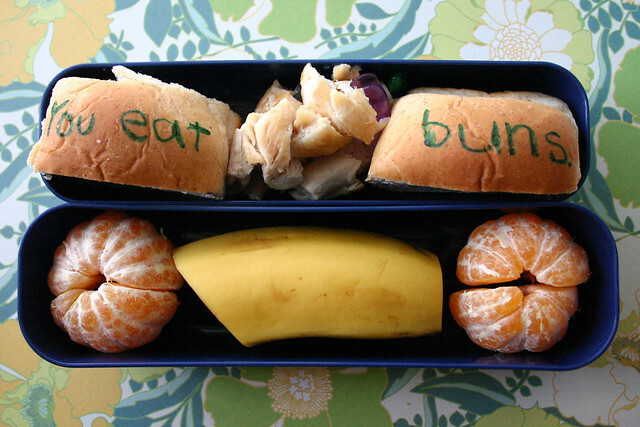 I hear from a lot of people who are interested in packing bento boxes lunches but don’t know where to begin. A friend tells them about bento or they stumble across a few links and they’re interested, so they spend some time looking at bento pictures online. After scrolling through a few dozen photos they’re overwhelmed by the possibilities of what they could do. Lots of questions run through their heads: Do I need a bunch of cookie cutters? Will I have to “glue” food with mayo or honey? Do I have to dye rice? Do I need to mold food into decorative shapes? Should I sketch out a plan for my bento box before I begin? My advice: Start small. Just do one thing. If you want to make elaborate scenes in your lunches and try out a million techniques — sure, go for it! That stuff is fun. 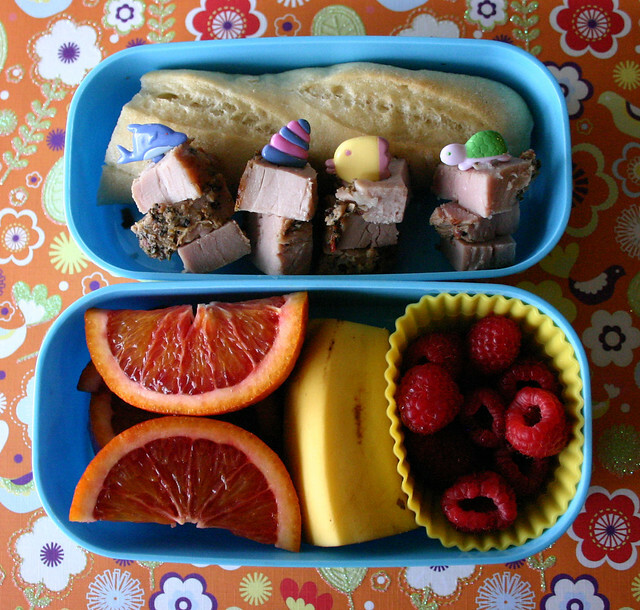 But, if you’d rather just dip a toe into the bento waters because you’d like to entice a picky kid to eat more or you want to treat yourself to a pretty meal on your lunch break, I think it’s best to start small. Most mornings I don’t really have time to execute a bunch of decorative techniques for my kids’ lunches but I’ve found that if I jazz up one item in the lunch, then surround that with colorful fruits and vegetables it goes a long way toward making lunches cute and attractive to the eye. It also makes lunch packing speedy. Here I cut an elephant shape out of tofu, then layered it on top of the rest of the block of tofu. The rest of the lunch was filled out with some broccoli and strawberries. Fold slices of salami in half or cut turkey into strips and roll it up (see the photo at the top of the post) and put that in the lunch box. 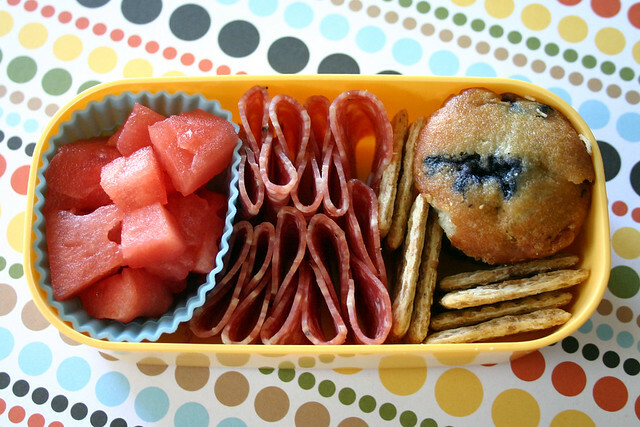 Once I finished with the salami, I tucked in some cubes of watermelon, a purchased mini muffin and some crackers. Arranging fruit or vegetables in a neat and tidy way (rather than just dumping them in the box) can make a lunch look prettier. Here, I put some clementine wedges in a baking cup and then arranged the top layer in a circle to make it look kind of flower-ish. Everything else — turkey, veggies, muffin, grapes — was just dropped in the box. 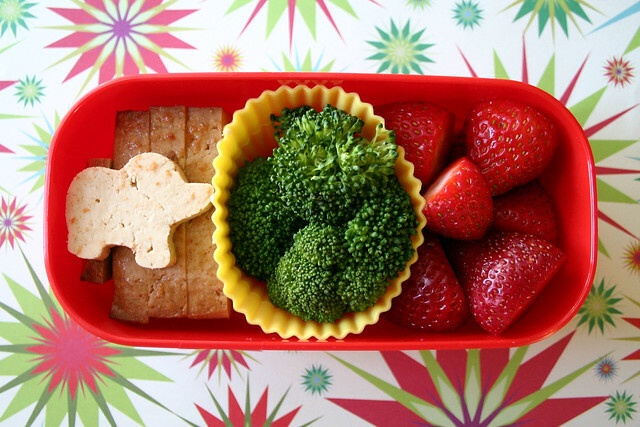 Finally, one of the easiest ways to add a little cute to a lunch is to poke a decorative food pick into something. You can put almost anything on a pick, but I tend to go with cubes of meat or cheese or firmer fruits and veggies like grapes or edamame. 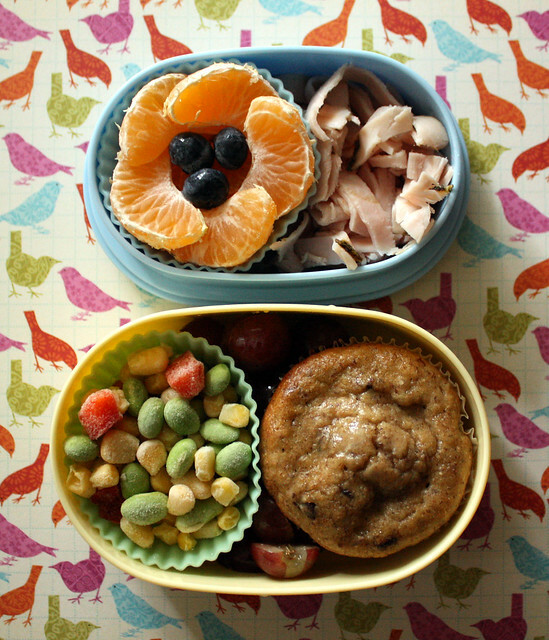 What’s your favorite, easy technique for making lunches cuter?